ARRL Field Day is the most popular on-the-air event held annually in the US and Canada. 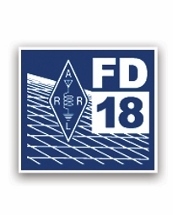 This year, many groups and participants may choose to combine 2018 Field Day with our year-long operating event – 2018 ARRL International Grid Chase (IGC) – working stations in as many grid squares as possible and uploading log data to ARRL's Logbook of The World (LoTW). Show your support for ARRL Field Day with official merchandise! Clubs, order early! Collect orders from club members, and place a single order (only $12.50 for shipping within the US for shirt orders over $50). For more information on ARRL Field Day including official rules, bands, log submissions and more visit: www.arrl.org/FieldDay.